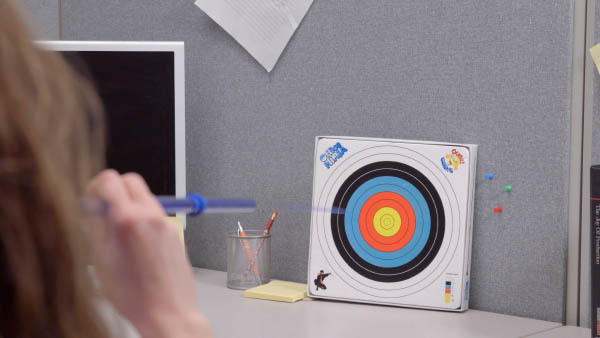 Office Ninja Indoor Blowgun: A blowgun set with a target. 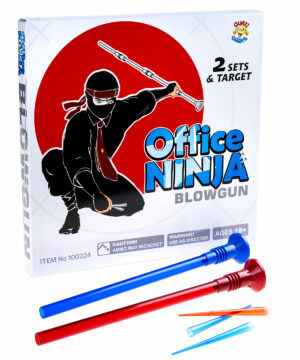 Stealthily evade real work and play with the Office Ninja Indoor Blowgun. 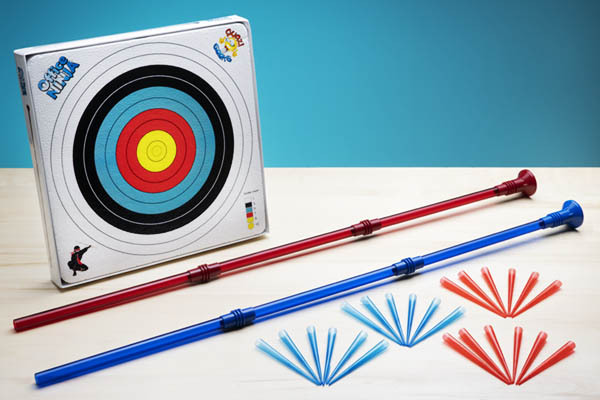 This acrylic blowgun set uses connected sections to make two blowguns, each of which are nearly two and a half feet long! 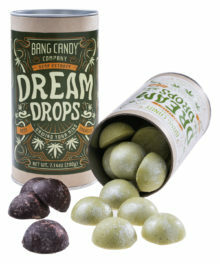 Despite their impressive size, the blowguns are easy to use: load a plastic dart into the mouthpiece, aim at the included styrofoam target, and blow. 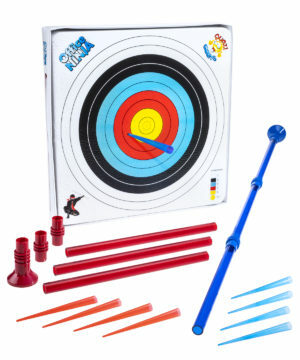 The dart satisfyingly sticks into the target, and the scoring guide printed on the target lets you know how many points you earned. 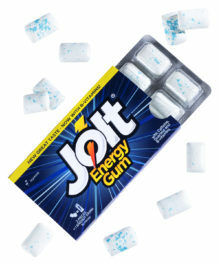 The soft (and non-poisoned) darts bounce harmlessly off of walls, furniture, and jugulars* so an off-target shot won’t be the end of your quest (or employment). *Obviously, don't try to shoot people in the throat! 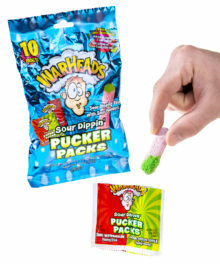 The two colored blowguns in the Indoor Blowgun set are each made of three acrylic tubes that join together with the included connectors. 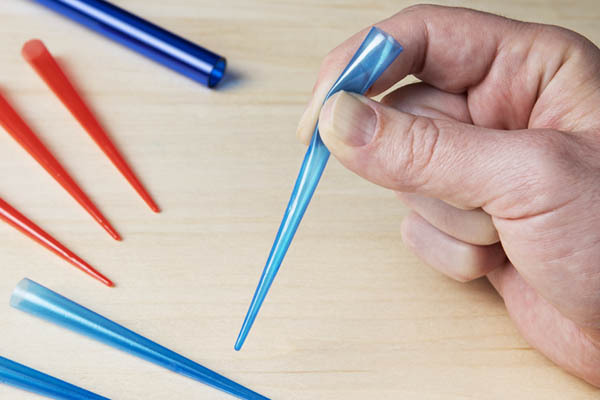 The easy-to-assemble toy mimics the two-handed bamboo blowguns used by ninjas... but like if the ninjas wanted to stash their weapons inside their cubicle desks afterward. It’s easy to assemble and fire! 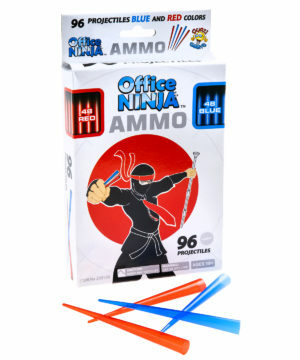 The Office Ninja Indoor Blowgun includes a styrofoam target to test your marksmanship against the other ninjas in your dojo or office. 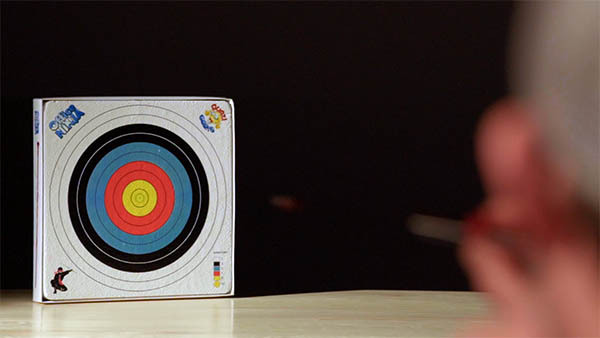 The target fits inside the box and hangs to any flat surface with the included suction cup. 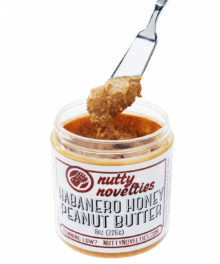 Or, if you want to get creative, take aim at paper, cardboard, styrofoam cups, or any other porous surface you can find. No matter what you pick, the plastic darts will ensure that no other furniture gets damaged in your quest. Question: How far away should I set up the target? 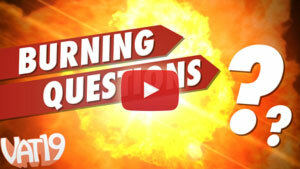 Answer: The manufacturer recommends standing 9-11 feet away from the target. The blowgun can certainly fire farther than that if you have superior ninja focus (and lung power). Answer: The plastic darts in the Office Ninja Indoor Blowgun are designed to not injure anyone should your shot go awry. That being said, it will sting the skin a little, so we recommend taking proper safety precautions when firing.